Google always works hard to improvise its open source operating system Android by presenting some finest apps in the Play Store. In September 2013, Android produced Root Uninstaller’s Sidebar Plus, which provides swift access to settings like Wi-Fi, GPS, Bluetooth, app shortcuts and other important Android features. The sidebar feature is essential fir multitasking and Sidebar Launcher is aimed to enhance this multitasking experience. It has a scope of customization and below are some features. 1. 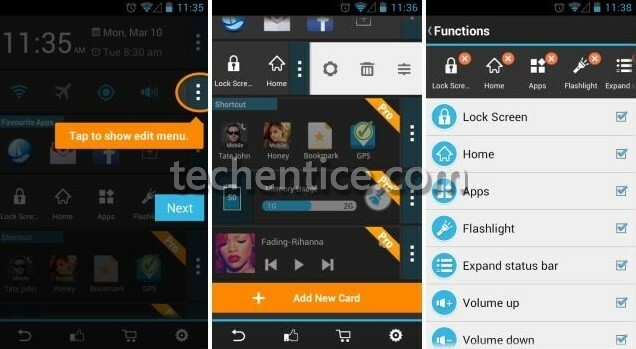 Sidebar Launcher provides a quick way to access different Android features. You can launch it from anywhere by swiping in from the left edge of the screen. This sidebar includes several features like a time and date widget, quick settings like Wi-Fi and GPS, favorite apps etc. Each widget is called a ‘Card’, and edit or customize the card according to your requirement. 2. Although some cards work on a rooted device, such as menu and back buttons on the Functions card, but in general most options work fine without root access. 3. It also allows you to add and edit cards, or reposition them via a small overlaid handle and allow to quick access to apps, recent messages, your call log, recent apps, power toggles. 4. The position and size of Sidebar Launcher can be configured from Settings. You can also enable or disable Autolaunch.